The Instrument Making Department, which is based in a specially equipped work studio, was established in 1975 and enjoys an international reputation with students travelling from abroad to attend this unique course. 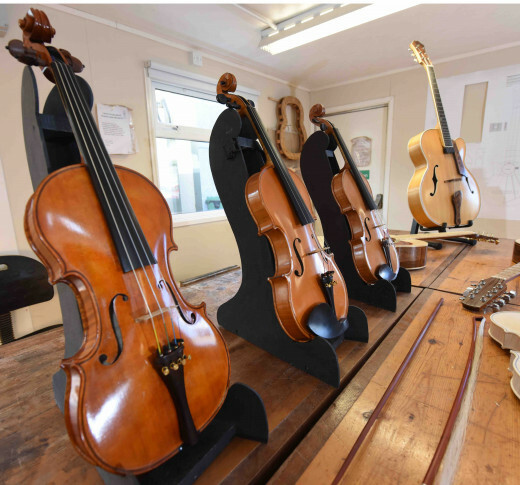 Artistry, craftsmanship and tradition are the foundation of the instrument-making course. The instruments crafted on this course include Violins, Violas, 'Cellos, Double Basses, Guitars, Harps, Mandolins and Ukuleles. · 1 year day course. · 2 year part-time night course which takes place each Monday and Tuesday night from 7.00 - 9.30pm. The primary objective of the course is to provide students with the fundamental skills and knowledge necessary to enter the instrument making and repair field as professionals. Emphasis is placed on quality craftsmanship in the tradition of the 17th and 18th century classical masters whose models and methods of construction are utilised and studied. Modern construction methods are utilised in the construction of Guitars and Mandolins. Students will work on a one-to-one and small group basis with the tutors. A balance of flexibility and structure ensures the development of disciplined work habits and the development of the technical and hand tool skills necessary to enter the field of instrument making and repair. As this is a specialised course and class sizes are limited to a maximum of 12 students early application is advisable.